The Order of Patrons of Husbandry, better known as The Grange, was the first fraternal organization in America to admit women as full members. As early as 1885, a resolution was passed at the order's national convention which recognized equality of the two sexes. The National Grange supported the advancement of legal status of women, including the right to vote and equal condition of citizenship in the United States. This support of women's right to vote in the Grange and outside of the Grange influenced women's suffrage later in the twentieth century. It was not until 1920 that women earned the right to vote as codified in the Nineteenth Amendment to the United States Constitution. Most fraternal groups at this time, such as Freemasons and Odd Fellows, gave women a role in affiliated organizations such as Eastern Star and the Rebekahs, but these organizations were separate, auxiliary organizations from the main organization and often required a (male) member of the main organization to preside at the meeting. Items from our collection document women's involvement in the Grange. Postcards as early as 1910 (like the one above) show women and men together promoting the Grange - in this case, all sitting on a float created for a parade. 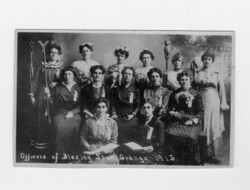 The other postcard seen here, showing members of the Blazing Star Grange, illustrates how women had the chance to lead a fraternal organization as officers. Other evidence of the Grange's support of equality of men and women can be seen in a 1911 Roll Call book from Charlemont Grange, in which men and women members are listed with their occupations. Some female members, with no male relatives who were members of the Grange, were admitted on their own merits. Despite the fact that these are postcards, there isn't any text that clearly identifies where either of these Granges were located. However, we've been able to identify the lower photo as members of the still-thriving Blazing Star Grange located in Danbury, NH. Check out the Concord Monitor's wonderful slide show about the Blazing Star Grange and keep your eyes peeled at the 1-minute mark for the image of the postcard seen above. We'd be happy to learn more about either of these two images. If you know more, just drop us a line!